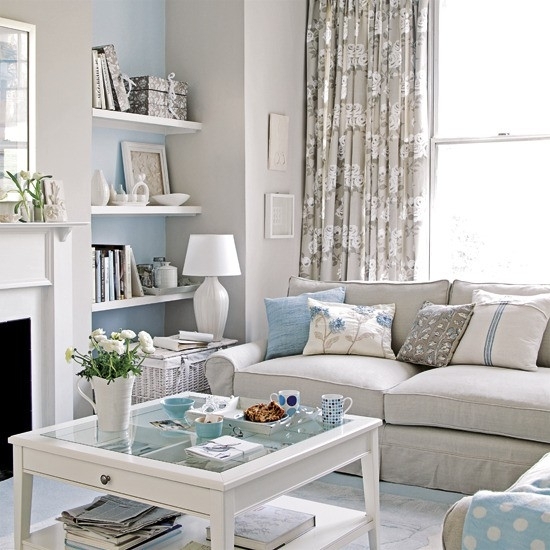 Vast majority of decoration ideas for small living rooms actually are about making the area appear roomier. And, such décor ideas indeed turn even closed up and confines spaced into beautiful and comfortable living areas. Space and light are essential when decorating but importantly, use the combination of scale, color and weight in a manner that brings out the best of the rooms you are decorating. Trying new stuff is exciting because sometimes, improving small spaces comes not from old ideas. For instances, long flowing drapes can replace blinds on the windows because drapes make the vertical space apparent and as such, expands the room. Your living room, in spite of its size, should be your entertainment and relaxation space. Here as such, are some of our tested and preferred décor ideas for making it roomier. Designers prefer to use mirrors in tiny spaces to give the rooms a spacious feeling. Hanging a large mirror especially in a central point so it is the major attraction, is one such idea. You can make the most of this décor idea by putting the mirror behind a source of light such as a pendant lamp or candle. The mirror will thus reflect the light and in the process, improve ambiance. Better yet, position the mirror across from the window so it reflects the view of the room. Like a plane, a room to has a vertical and a horizontal dimension. Rooms with high ceilings present a great opportunity because you can expand the house upwards if you decorate while paying attention to the vertical space. There are various options of achieving this including using stylish floor-to-ceiling drapes. You can also opt to fill this vertical space with a collection of artwork. These two techniques will give the living room a roomier feel because they expand the focus over and above the traditional eye-level. Using neutral colors especially on walls, ceiling, floor, and furniture upholstery is an age-old décor idea. 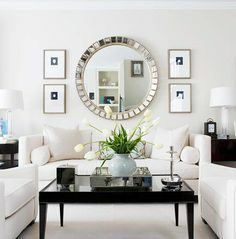 It has three impressive effects; beige or off-white palettes expand your space by ‘pushing’ back the walls while soft colors brighten the room because they reflect light. These colors also give the living room a calming effect full of sophistication. Visual weight is an important aspect. It describes the perception that an item’s heaviness has something to do with its color, size or design. Based on this perception, you should pick furniture pieces that appear light, as they will help free up space. Pale colors do great over darker hues. In addition, pieces with legs create a roomier feel as opposed to those that have boxy designs. Glass end or coffee tables are preferable to wooden ones. Essentially, any furnishing that does not limit views creates spacious feeling. It goes without saying that a small living room needs size-appropriate furniture. Pieces that don’t take up all the space or overpower the room are preferable. A thin sofa with equally thin arms and a back with correspondingly tight upholstery fit well in such a space as opposed to one with fluffy arms and a huge cushioned back. Alternatively, you can discard the couch completely especially if you have a tiny space. Instead, go for a love seat or four chairs that fit snugly around your coffee table. Here, armless chairs that take lesser space are preferable.